There are four types of relationships: one-on-one, one-to-many, many-to-one and many-to-many. The relationship may be unidirectional or bidirectional, and each can be simple (a one to one model) or more complex (a combination of models). 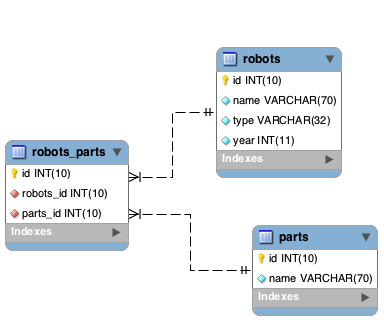 The model manager manages foreign key constraints for these relationships, the definition of these helps referential integrity as well as easy and fast access of related records to a model. Through the implementation of relations, it is easy to access data in related models from each record in a uniform way. Unidirectional relations are those that are generated in relation to one another but not vice versa. The bidirectional relations build relationships in both models and each model defines the inverse relationship of the other. In Phalcon, relationships must be defined in the initialize() method of a model. The methods belongsTo(), hasOne(), hasMany() and hasManyToMany() define the relationship between one or more fields from the current model to fields in another model. Each of these methods requires 3 parameters: local fields, referenced model, referenced fields. The model Robots has many RobotsParts. The model Parts has many RobotsParts. The model RobotsParts belongs to both Robots and Parts models as a many-to-one relation. The model Robots has a relation many-to-many to Parts through RobotsParts. The first parameter indicates the field of the local model used in the relationship; the second indicates the name of the referenced model and the third the field name in the referenced model. You could also use arrays to define multiple fields in the relationship. Depending on the needs of our application we might want to store data in one table, that describe different behaviors. For instance you might want to only have a table called parts which has a field type describing the type of the part. Using relationships, we can get only those parts that relate to our Robot that are of certain type. Defining that constraint in our relationship allows us to let the model do all the work. In the above we have a Robots model which has three properties. A unique id, a name and a type which defines what this robot is (mechnical, etc. ); In the Parts model we also have a name for the part but also fields that tie the robot and its type with a specific part. NOTE The field mappings in the relationship are one for one i.e. the first field of the source model array matches the first field of the target array etc. The field count must be identical in both source and target models. When explicitly defining the relationships between models, it is easy to find related records for a particular record. Phalcon uses the magic methods __set/__get/__call to store or retrieve related data using relationships. By accessing an attribute with the same name as the relationship will retrieve all its related record(s). // if both relationships have the same name? * Model class for the robots table. 'conditions' => "inv_status = 'paid'"
By default, relationships do not act like database foreign keys, that is, if you try to insert/update a value without having a valid value in the referenced model, Phalcon will not produce a validation message. You can modify this behavior by adding a fourth parameter when defining a relationship. If you alter a belongsTo() relationship to act as foreign key, it will validate that the values inserted/updated on those fields have a valid value on the referenced model. Similarly, if a hasMany()/hasOne() is altered it will validate that the records cannot be deleted if that record is used on a referenced model. The above code set up to delete all the referenced records (parts) if the master record (robot) is deleted. Saving the album and the artist at the same time implicitly makes use of a transaction so if anything goes wrong with saving the related records, the parent will not be saved either. Messages are passed back to the user for information regarding any errors. You need to overload Phalcon\Mvc\Model::save() for this to work from within a model.